This remedy for headaches is something my wise and wonderful father taught me. Ever since I was a little girl, whenever I would complain of a headache to my father, he would reach for my hand and start massaging the area between my thumb and index finger with his thumb. While this was painful (most times, I would recoil and pull away before he can even begin! ), it was also extremely effective in relieving my headaches. I’m not sure why this simple palm massage works. One theory says that the stimulation of pain while massaging that area distracts your nervous system from relaying the headache pain signals. Simply put, you’re tricking the pain from your headache into going away by switching your body’s attention from one type of pain to another. While this is interesting, it doesn’t explain why the relief lasts even after the massage is completed. 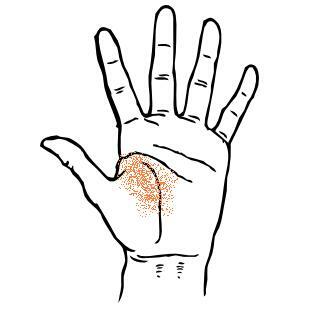 Perhaps a better reason why this works is the one offered by Chinese reflexologists—in that, the particular area on our palms is an acupressure point for the adrenal glands, and massaging it eases the blockage that was causing the headache. Where on the palm to massage? This area to massage is within the webbing of your hand between the thumb and finger next to it. Using your other hand’s thumb and index finger, look for a particularly sore or sensitive spot when pinched down firmly. While it’s nice to have someone else massage your hand, you can also self-massage your palms easily, taking turns for each hand. The best part of this headache remedy is that you can do it anywhere—at work or while traveling. One thing I’ve noticed—the worse my headache was, the harder and tougher that area would be. At worse, it can feel like a tight, hard knot of muscle*. And the tougher the area, the more painful the healing massage would be. In those cases, even a soft press would be agony. However, because I know from experience just how effective the massage is, I would persist through the pain. If you find the pain from the massage too much to bear, just start off with a slow press and a gentle circular motion, building up pressure gradually. The hard knot should loosen if you persist. * Whenever I test this area while I’m feeling fine, it’s soft and pliable, which is its natural, healthy state. Baking soda effectively prevents body odour, but it won't prevent sweating. And that's a good thing. When you plug your sweat pores unnaturally with commercial antiperspirants, you're actually forcing your body to release toxins through other means such as skin eruptions (e.g. acne, pimples and rashes). Epsom salt (i.e. magnesium sulfate) helps our bodies to expel toxins and heavy metals. As magnesium sulfate is easily absorbed through the skin and acts as a natural sedative, taking epsom salt baths can be very soothing when we're stressed or if our nerves are frazzled. Previous PostPrevious Detox dreams = scary nightmares? This palm massage is similar to foot massage. This ideas is tested and good for health. this is really interesting, next time I get a headache I’ll try this! This method of reducing headaches is quite interesting. I will definitely try it out! In varma we also have these type of massage. I used to do this trick to my husband and he thought it was weird, but it really works. I find that the tips of my fingers on the sides work well, I’ve never tried this particular area of my hand. I will have to try this next time I have a headache. Hi Melanie, that’s interesting that rubbing the sides would work too. I do remember there being a “stiffness” there too the last time I had a headache so it makes sense. Thanks Melanie for the headache tip it’s very useful acupuncture method. And try out with someones help for neck massage it’s also helps for headache too. that area is often tense and painful for me, a bit like shoulder muscles for other people. you guys may wanna look at reiki too. its an interesting concept i recently discovered, involving use of hands to treat your body well. I just tried this in a meeting when I could feel a headache starting – it worked! thank you! I have heard of this before and have tried it when I remembered it. It does sometimes work. Perhaps the times it didn’t I just wasn’t persistent enough to keep at it until it worked. I sometimes want instant relief instead of slower. But I hate taking any sort of medication. I will continue to try the slow, natural way instead. Interestingly, my mother used to do this to me when I was a kid – whenever I had headache. It was a long time ago, can’t remember if it worked. Yet I do remember I enjoyed her attention. So, if nothing else, at least that latest would definitely ease the pain. I read this article couple months ago and it really helps, thanks for advise.